I recently came across an obituary for this I./JG 2 pilot in Jägerblatt 1/1998. A quick 'search' revealed nothing further - just some scraps of information from a thread posted in 2010 on the TOCH forum - he was a Do 17 pilot, he had survived a crash on 20 December 1940 and flew with JG 2 in 1945 (Goss/Shelfin/Salonen here). Information on him was fragmentary to say the least..
Willi Kohlstrunk was born on 24 August 1918 in Meißen, a town just north of Dresden. He joined KG 3 during the Battle of Britain (August 1940) as a Fahnenjunker-Unteroffizier after qualifying from LKS 2 Berlin-Werder. He flew day and night sorties over England, III./KG 3 being based in St. Trond, Belgium. During a mission against London on 20 December 1940 his Dornier Do 17 Z WNr. 2645 was hit by anti-aircraft fire, knocking out an engine. Turning for home Kohlstrunk was unable to maintain his altitude and the aircraft gradually lost height in the cloud deck. Weather conditions were poor and the second engine started to run roughly. The bomber emerged from the cloud base at roof-top height over Belgium and the pilot elected to carry out a belly landing on the airfield - having flown 'blind' from England the crew had arrived over St. Trond, north of Liège (Lüttich). The landing proved to be catastrophic as the machine careered into a raised embankment - this was 'unintentional contact with the ground' according to the loss details..
Fl.Pl. St. Trond, Absturz um 14.25 Uhr infolge unfreiwilliger Bodenberührung. Bruch 70 %. Injuries among the crew were severe. 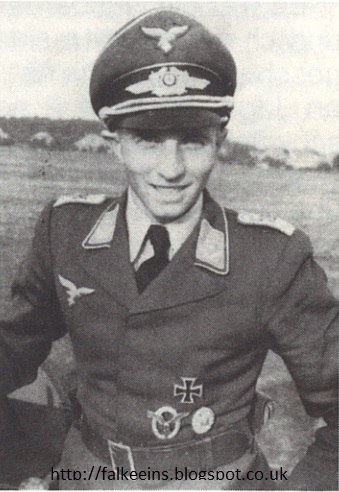 Gunner Herbert Hoppe was killed. Pilot Kohlstrunk had both his legs broken. While his left leg healed, it was four months later in April 1941 that Kohlstrunk's right leg had to be amputated below the knee. He eventually returned to second-line duties at LKS 2 during 1942 with a prosthetic limb. As the war situation deteriorated sharply during 1944 Kohlstrunk volunteered for fighter pilot training and in late 1944, now with the rank of Oberleutnant, he joined JG 2 'Richthofen' operating in the Reichsverteidigung in the Rhein-Main area. 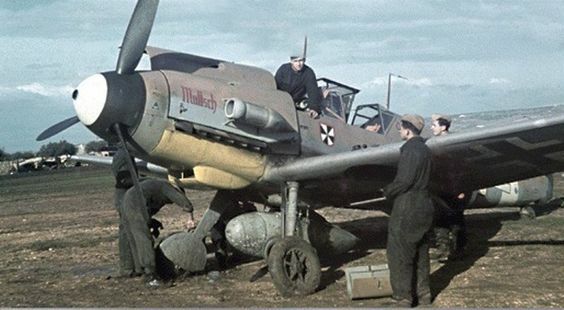 He flew sorties from January 1945 with I./JG 2 from Großostheim airfield in a Fw 190 D-9 marked 'winkel balken'. He flew eight combat sorties between 18 and 23 March 1945. Attacking US bombers south of Mainz on 23 March 1945 his machine was set on fire. Kohlstrunk managed to jump clear of his burning Dora but collided with the tail fin, losing his prosthetic limb and badly injuring his right knee in the process. His injuries required another long hospital stay and were such that a second amputation of the right leg - this time above the knee - became necessary. Post-war this former youth athletics champion (3,000m) returned to his home town Meißen in the Soviet zone of occupation, eschewing crutches but necessarily walking with a very heavy limp. He eventually found employment in the West - a large industrial concern in Frankfurt am Main. He died on 8 October 1997 aged 79 years after a long illness - 'Ich habe meine Pflicht getan' He had always done his duty.